There are some decisions in life that do not need a lot of thought and opting for an energy-efficient boiler is one of them. The fact it will cause less damage to the environment is tremendously appealing but the fact it will save money is the clincher. The savings are significant. If everyone in the UK with gas central heating installed a high-efficiency condensing boiler it would save enough energy to heat 3.7 million homes for a year. Put another way a new boiler can cut a third off heating bills or up to 40 per cent if proper heating controls are fitted too. 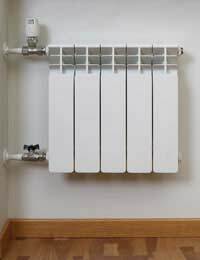 An energy-efficient condensing boiler works by utilising much of the heat that is lost to the atmosphere through the flue of a conventional boiler. New boilers have larger heat exchangers - or sometimes two heat exchangers - to maximise heat transfer from the burner, and can also recover the latent heat given up by flue gases. It means gases leaving the flue of a condensing boiler are typically between 50 and 60 degrees Celsius, compared to between 120 and 180 degrees in a conventional boiler. The best new boilers can convert 90 per cent of their fuel into heat, but that rate drops to 78 per cent for conventional boilers. In the boiler's lifetime, which is around 15 years, it can save approximately £3,000 on the average domestic heating bill if it's energy efficient. There is an easy way to tell how efficient a boiler is. The SEDBUK (Seasonal Efficiency of Domestic Boilers in the UK) rating ranks boilers on their efficiency in converting fuel to heat. Ratings are from A to G, with A-rated boilers being more than 90 per cent efficient. If a boiler is more than 10 years old, it is not likely to be energy efficient. The good news is that there may be grant assistance available through the Government, energy suppliers or local authorities to help meet the cost of replacing it. Most local authorities offer grants and incentives to residents installing energy-efficient measures in their homes, while the biggest energy suppliers are obliged to meet targets under the Government's Energy Efficiency Commitment and typically have a range of offers as a result. Government funds provide up to £2,700 to households on certain benefits, although the eligibility criteria differ between countries. The funds are called Warm Front in England, Warm Deal and the Central Heating Programme in Scotland, Warm Homes in Northern Ireland and the Home Energy Efficiency Scheme in Wales. As boilers account for around 60 per cent of all domestic carbon dioxide emissions, it is perhaps not surprising that by law most new boilers fitted in the UK must be the energy-efficient condensing type. The few exceptions are for reasons of suitability, but luckily the new boilers can easily be fitted to the majority of new and old heating systems. There are alternatives, however. Biomass fuel boilers are carbon neutral, as the carbon dioxide released when generating energy is equivalent to the carbon dioxide absorbed during the fuel's production. Biofuels, sometimes called bioenergy, are typically wood chips, logs or wood pellets for small-scale domestic boilers and it is important to have somewhere to store the fuel. Also, a specific flue is required and must meet planning, safety and building regulations. Installation costs fall between £5,000 and £12,000 with annual fuel bill savings of around £200, but the real winner is the environment, as a biomass fuel boiler can reduce carbon dioxide emissions by eight tonnes a year.